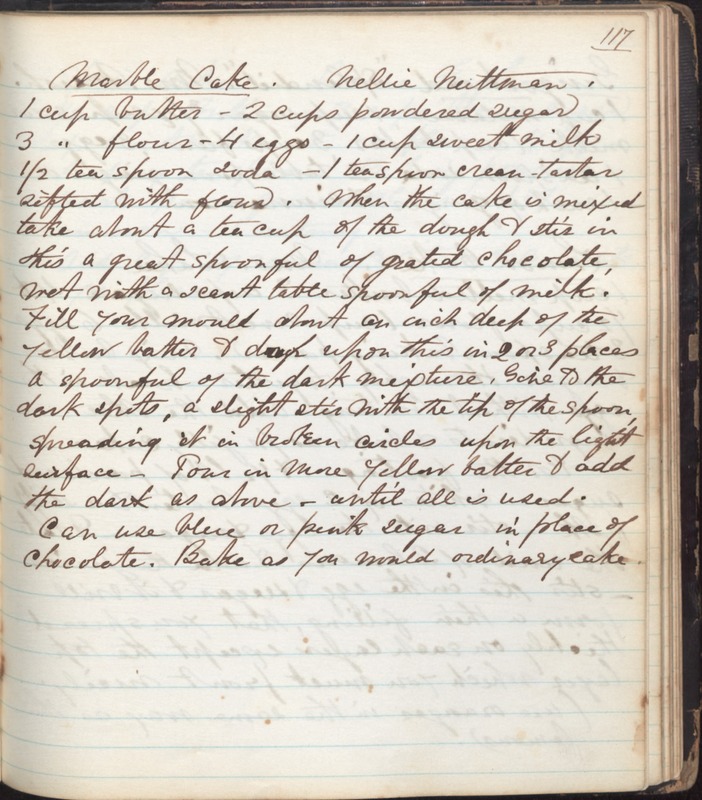 Marble Cake Nellie Nuttman 1 cup buter-2 cups powdered sugar 3 " flower- 4 eggs- 1 cup sweet milk 1/2 tea spoon soda- 1 tea spoon cream tarter sifted with flour. When the cake is mixed take about a tea cup of the dough & stir in this a great spoonful of grated chocolate melt with a 2 scant tablespoonful of milk. Fill your mould about an inch deep of the yellow batter & drop upon this in 2 or 3 places a spoonful of the dark mixture. Give to the dark spots a light stir with the tip of the spoon, spreading it in broken circles upon the light surface- Pour in more yellow batter & add the dark as above - until all is used. Can use blue or pink sugar in place of chocolate. Bake as you would ordinary cake.